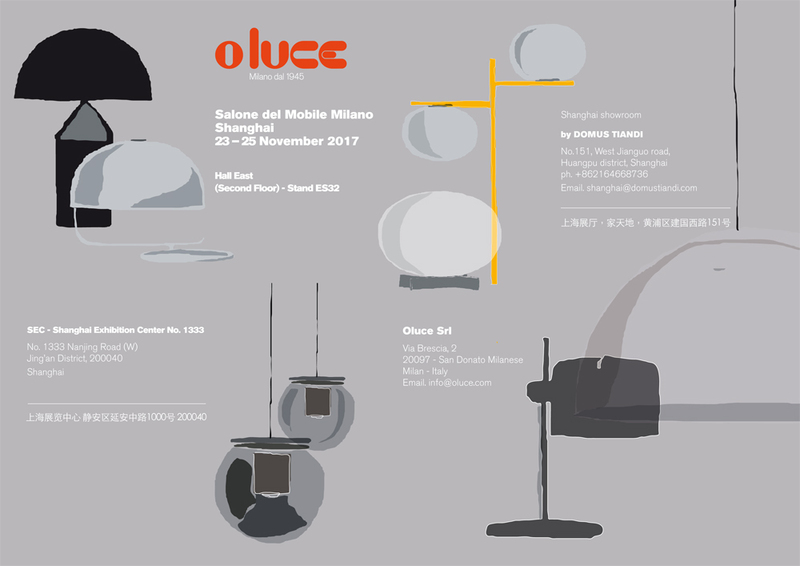 Oluce has confirmed its presence at the Salone del Mobile.Milano Shanghai, participating in the second edition of the trade show, which will take place from 23 to 25 November at the SEC – Shanghai Exhibition Center, a prestigious reference point for the city’s cultural and artistic events. Iconic products like Atollo, Sonora, Coupé, and The Globe will be featured in the display, located in Hall East (Second Floor) – Stand ES32, together with some of the lamps that represent the company’s contemporary style – including Switch, Canopy, Duca, and Superluna – and a selection of the most recent collections introduced during Euroluce 2017 – such as Alba, Recuerdo, Eva, e Cilynda – which will be making their debut in the Chinese market. After last year’s success, the Shanghai trade show has affirmed itself as a reference point for companies which, like Oluce, embody the values of Italian design in the East. In fact, with over 70 years of experience, an elective affinity with the world of design, and an aesthetic sensibility that is recognizable, sophisticated, and at the same time pragmatic, Oluce represents the oldest Italian design company still active in the field of lighting. The allure of the brand and its products are already known and admired in China, where Oluce has been present for some time with a dedicated space within the showrooms of Domus Tiandi Beijing and Domus Tiandi Shanghai, renown reference points for architects, interior decorators, designers, and design aficionados. Its presence at the Salone del Mobile Milano.Shanghai is aimed at reaffirming the importance of the Chinese market for the company, strengthening the network that already exists in the territory, and creating new business opportunities.